Here is an adorable version of our famous baby name seat designed just for little girls. It makes a great gift idea for a new baby and is also perfect as a first birthday gift. Children just love these little stools, perfectly sized for them with their very own name as a colorful puzzle. 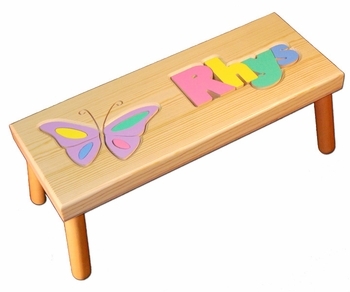 This stool features the addition of an 8 piece butterfly puzzle next to the child's name. Made of solid, furniture grade wood, each stool is made in the USA and built to last. The seat stands 9 inches high and measures 9 by 23 inches. Includes the child's name (up to 8 letters). Non-toxic, water based paints are used. If desired, you can select the option to have us engrave the seat bottom with a custom message or the baby’s birth information for an added personal touch.